This system in which a child is constantly moving objects with his hands and actively exercising his senses, also takes into account a child's special aptitude for mathematics. When they leave the material, the children very easily reach the point where they wish to write out the operation. They thus carry out an abstract mental operation and acquire a kind of natural and spontaneous inclination for mental calculations. ~The Discovery of the Child, Maria Montessori. The Montessori math materials are perhaps some of the most inviting and beautiful works in the Montessori classroom. Visitors to my Montessori classroom, young and old alike, gravitate to the math shelves, wanting touch and learn how to use the materials. “Show me this. How does this work?” they ask. Adults usually sigh and wistfully say, “I wish I had learned math this way”. Enjoy this in depth look as we explain Montessori Math curriculum materials, activities, and philosophy. Maria Montessori believed that the children can absorb mathematical concepts naturally. She recognized that there were sensitive periods in the child’s development whereby the acquisition of mathematics was eagerly and joyfully explored through indirect preparation and repetition of activities with concrete, scientifically developed didactic materials. By means of the Montessori Practical Life and Sensorial activities, children experience the concepts of order, sequence, measurement, calculations, and exactness. In order to fully develop the developing mathematical mind, Montessori teachers and parents acquaint the child with order and exactness by the intentional way we set up and organize the shelves and trays and how work is laid out on a work mat in the Montessori environment. Work is displayed in a progressive and sequential fashion and each activity is broken down into logical and sequential steps. Young Montessori students learn about making calculations and estimating by determining how many drops of water it takes to fill a vessel and about precision and exactness by learning to measure out drops of food coloring or plant food. These Montessori Practical Life activities not only help the child gain independence, but also provide the indirect preparation for higher level math skills. 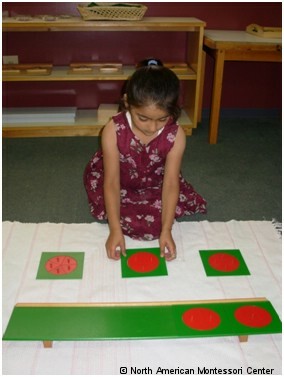 The Montessori Sensorial activities help the child learn to discriminate between similarities and differences. Young Montessori students discover relationships, make scientific hypothesis, and draw conclusions as they construct and compare a series of sensorial activities. The activities heighten the child’s awareness of the mathematical relationships found in the natural world. As the child develops in the Montessori environment, she is ready to encounter more concrete math materials in which to explore more abstract thought, beginning with quantity. Dr. Montessori discovered that a child who could count and recognize the symbols 1-9 could count in quantities of hundreds and thousands. The Montessori “Golden Bead” material was developed to give children the concrete exploration of the decimal system. The lower elementary Montessori classroom is full of ongoing discoveries. Spurred on by the telling of the fifth Great Lesson, “The History of Mathematics”, children are motivated to learn about their own number system and uncover the mysteries as did those who came before. The absorbent mind of early childhood has given way to a reasoning mind which enjoys learning about natural truths and laws of nature. The mathematical facts learned in the Montessori Children’s House are now tested to see if there are rules and laws to be discovered and manipulated. Patterns are sought as the child seeks to discover the empirical truths of the universe through the use of the concrete Montessori math materials. It is now that children are able to use their imaginations to see beyond the immediate. They are able to see beyond the concrete representations and imagine higher place values within the decimal system. Montessori lower elementary age children are much more social beings than they were in the Montessori Children’s House. They enjoy working collaboratively and sharing their discoveries with each other. After all, the laws of the universe are too incredible not to share! The inquisitiveness of the upper elementary Montessori student is astounding. The beauty of the advanced squaring and cubing materials beckons like beacons, inviting the students to come explore and learn with them. They dive into the study of fractions and decimals, eager to move beyond to more complex mathematics, geometry, and algebra. While the concrete materials are still in place, the need for repetition is gone. “Show me. Then, show me more” is the litany of the upper elementary Montessori math students. Upper elementary students move quickly from the concrete experience to abstract thought. They are eager to test their knowledge with pencil and paper and need, at times, a gentle reminder to return to the materials as a way of building neurological pathways. © North American Montessori Center - originally posted in its entirety at Montessori Teacher Training on Tuesday, June 8, 2010. I find this article very helpful and resourceful. I enjoyed reading this article and hope to read articles such as these in the future! After reading this article, it is evident that the 3-6 age group is a crucial stage for developing an understanding of basic math concepts. The use of concrete materials at this age really prepares students to move from the concrete to more abstract thinking during 6-9. Students are able to use prior knowledge to explore mathematical concepts even further. Their knowledge fractions, geometry, addition, subtraction, multiplication and division becomes more complex but because they have the basic understanding, they are able to cope with these more abstract ideas. I thoroughly enjoyed reading this article. There were several key points that stood out for me. I taught in a regular public education school for the past seven years. As I work through my Montessori training, I have come to realize that far too often I would take my students to abstract and complex tasks when they were not necessarily ready for it. For many concepts, particularly in Mathematics, I think I often jumped to the process or abstract work of solving equations and following sequential steps, and I often did not provide enough time for my students to explore and foster a deep understanding of the required pre-requisite skills. One aspect that has stood out for me in the Montessori training has been to provide students with many opportunities to work with the materials and allow them to master a skill before moving on to the next activity or concept. I had always strived to do this, however, I often felt the pressure to get through our curriculum instead of following the child. I attended a Montessori training workshop where the presenter repeatedly emphasized, ‘never give more to the mind than you give to the hand.’ I felt that this article really helped remind me of the importance and significance of this. It is important that students are provided ample opportunities to use the materials and sensorial activities in the 3-6 age range so that they become strong mathematical thinkers and are able to move from the concrete materials to more complex activities and become abstract thinkers. It makes sense that by 9-12 age range, students are more eager and ready to engage in abstract thought and answer pencil and paper questions because they have been provided numerous opportunities within the Montessori environment to explore the concrete materials and develop the necessary vocabulary, knowledge, and skills required. I really enjoyed learning about the sensitive period and the different stage of development. I do feel at a younger age, I would have liked to learn and manipulate mathematical concept with Montessori material. I wasn't very good in math concept and did not enjoy this subject at school because it was not sensorial but abstract. I do my best today to make things as much concrete as possible at the beginning and slowly I follow the path of concrete to abstract. One thing, I have to admit. Because of the 2 NAMC binder on Mathematic in this course, and by exploring with the Montessori material, I did finally understood some math concept that was still unclear. I finally got what I wanted and to learn my math using manipulative materials and I had fun. It's going to be easier for me to explain to my students because I felt it. Learning mathematical concepts in a Montessori classroom begins concretely and progresses towards the abstract. They are developed from simple to complex. Process is taught first and facts come later. Order, coordination, concentration, and independence are experienced by the child using these materials. The math activities are organized into five groups. Group one introduces sets of one through ten which prepares the child for counting and teaches the value of quantity. Children begin to associate numeral and quantity with number rods and number cards. A child will gain a growing understanding of sequence. Spindle boxes, cards and counters, the short bead stair, and other 1- 10 additional counting activities a teacher may add, reinforce the one through ten numeral concept. Group two involves the decimal system using the golden bead material. The child will become familiar with the names of the decimal categories; units, tens, hundreds, and thousands. A concrete experience with each category is represented by beads. Quantity will be followed by symbol and association. Group three deals with the operations using the golden bead material. The concept and process of addition, subtraction, multiplication, and division are presented. Children work with each other and benefit from these exercises using the bank game. Progression then continues using operations with the stamp game. Group four consists of linear counting. Quantity is presented using the teen and ten boards followed by symbol and association. The one-hundred board and bead chains develop number concepts and recognition of numbers one through one-hundred. The bead chains also introduce the child to skip counting; five, ten, fifteen, twenty, etc. Group five contains activities such as strip boards, snake game, and memorization of facts. Fractions are also a part of this group. Fraction skittles and insets serve this purpose. The activities in the Math area are not to be implemented at a set pace. Providing the child with the materials at precisely the right challenge level will enable the child to demonstrate his development to the teacher through his progress. A child that is able to grasp such math concepts as addition and subtraction demonstrates the successful use of the math materials. The materials are so beautifully designed and appropriate for each child during his sensitive periods of learning math. Mathematical apparatus provides the necessary stimulation for the child to learn math concepts more readily. Lower Elementary students are very social and work well in a collaborative environment. Reading about the different learning concepts has opened my eyes as to how many ways you can really differentiate your teaching style.